A woman escaped without injury after crashing into another car on an icy road in Daventry which wasn't gritted, despite the police asking the council to do so. Welton Road is one of 497 roads no longer deemed a priority for gritting by the county council in a move to save the cash-strapped local authority £475,000. Northamptonshire Police's response team in Daventry tweeted: "This poor motorist had a fright when her car skidded down the hill and crashed into another car. "No one was hurt. Our request for the road to be gritted (as it was an ice rink) was refused by the council. Please take care!" Gritting is undertaken on precautionary routes whenever there is a forecast temperature of 0.5C or lower over a 24-hour forecast period, and they take priority when it snows. Roads on the adverse network, which the 497 roads are part of, will instead be treated in daytime hours in advance of a high confidence forecast for snow or when temperatures are not forecast to rise above zero for 48 hours. In effect, it means it will have to be much colder for much longer for these roads to be gritted. A list of the downgraded roads can be seen here. 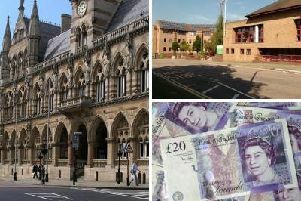 A spokesperson for Northamptonshire County Council said: “The council grits over 1543km of roads across the county and has a finite gritting resource which needs to be applied in the most effective way.